What led you to establish CCU and what is the main focus of this venture? Personal experiences and those of friends and relatives, with regard to cost and inconvenience associated with post-operative or continuous care, clearly built a case for services at home to address critical care, outside the ambit of hospitals. Critical care needs a high level of medical expertise, along with equipment and medical electronic, to be provided and managed in the home of the patient. Informal arrangements do not work as the family and friends of the patient cannot devote dedicated time and attention required in critical cases. Therefore, there is a need for an organisation that provides these services in an organised and structured manner. CCU’s objective is to fill this gap by providing all elements required to manage critical care at home. Elaborate on the Investments involved. What is your strategy for growth? Training and development: The home healthcare industry is in a nascent stage in India. Not enough professional and trained talent is available. Therefore, significant investment needs to go into building up a resource base that can deliver high quality and world class services. The strategy for growth entails both vertical growth of critical care services as well as horizontal growth covering more geographies, including overseas. Appropriate plans are being chalked out for expansion towards the end of 2017. What is the current status of profitability in the organisation? The important objective of CCU, when it was set up, was to focus on unit economics. This has led to a profitable operation from the very first month in Delhi/ NCR region. Focus on unit economics has not only led to above average industry gross margin, but a tight control on indirect expenses has resulted in positive net margin. CCU lays down a clear objective for any new territory – to break-even at the end of three months. How will leveraging technology assist in bridging the gap in home healthcare? There is already significant and increasing use of IT, globally, within medical services. However, with advancement in medical electronics and IoT, integration of these technologies provides tools for much sharper monitoring and care of patients, as well as, enhanced positive experience for the stakeholders — the patient, the treating doctor and other clinicians as well as the patient’s family. Therefore, use of technology will play a key role in user acceptance of critical care services at home; rendering of services that assist treatment based on continuous feed of data and analytics; expansion and monitoring of these services in smaller cities at an affordable cost. Home healthcare is usually associated with higher cost. Is that still a concern or have you managed to make these services cost effective? 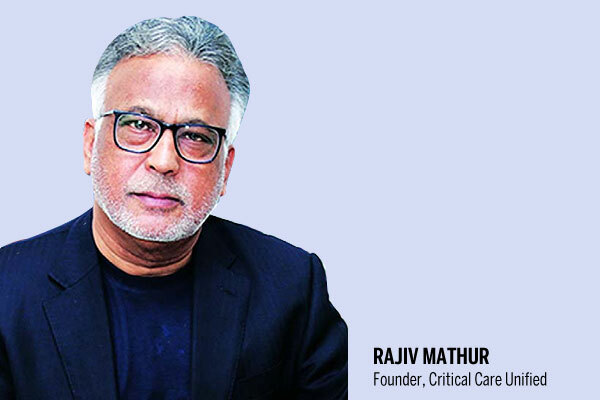 Home healthcare services need to deliver value for money. The alternative to home care is care in a hospital as informal arrangements with help of friends and relatives are getting less and less viable. When compared to the cost associated with care in a hospital, home care is significantly cheaper, ranging from 30 per cent to 75 per cent, depending on the level of care, with much lower inconvenience for the patient and family members. Greater availability of trained manpower and achieving a critical mass will enable home healthcare to be a viable and affordable alternative. In doing so, would you be partnering with hospitals? Hospitals are and will continue to remain the most important element in the value chain of healthcare, especially in cases of critical care. Therefore, partnering and integrating with hospitals in the care continuum is not only germane but fundamental to success of home healthcare. CCU not only partners with hospitals but also implements a model of coordination right from the point of discharge, transition to home and then ongoing care. Robust processes and SOPs drive this endeavour.